Print clean, crisp graphics in color or black and white. 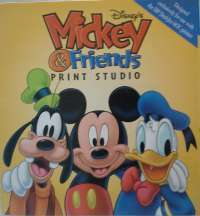 Create exciting print projects with over 200 images of your favorite Disney characters. It includes Mickey, Minnie, Donald, Daisy, Goofey, and Pluto. Select from a variety of page layouts. Make Banners, Calendars, Letterheads, Envelopes, Note Paper, Name Tags, Greeting Cards & more.